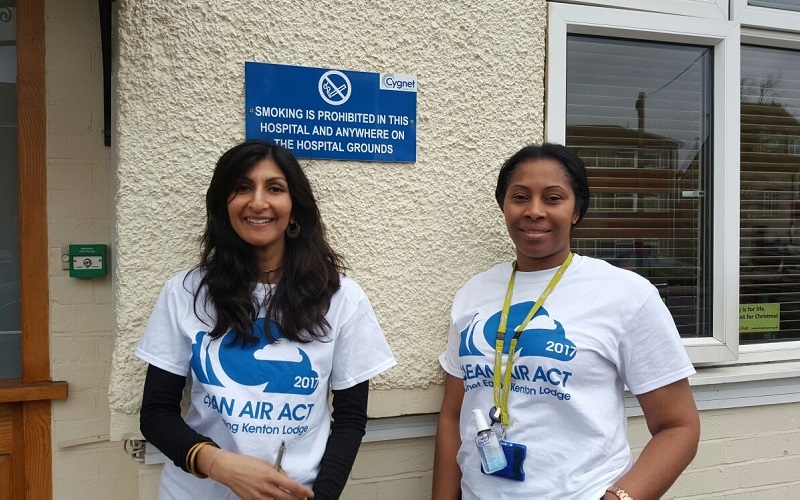 On Friday 31 March 2017, Cygnet Hospital Ealing and Cygnet Lodge Kenton marked going ‘smoke free’ with their own Clean Air Act 2017 celebrations. The purpose of the festivities was to mark the end of smoke-filled lives and spaces at Cygnet, and the beginning of healthy new policies and lifestyles. 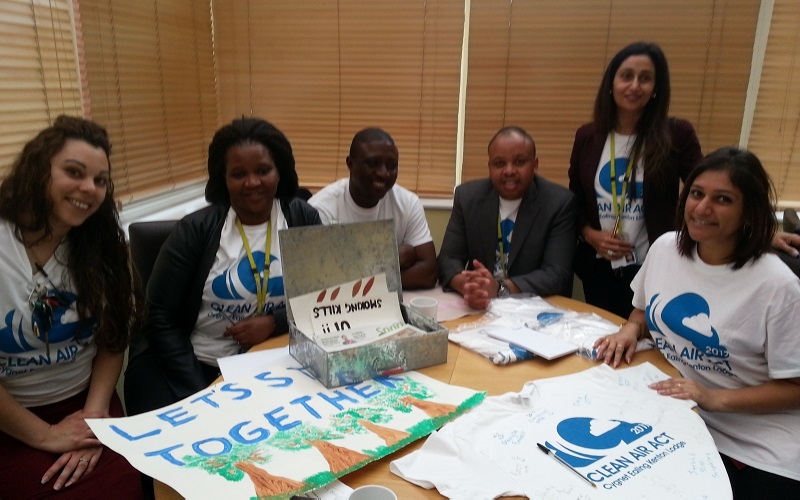 The celebrations were attended by service users and staff from all service and departments with everyone wearing especially designed Clean Air Act 2017 t-shirts. Healthy drinks and snacks were provided and educational posters were also prepared for the appreciation of all who attended. A ‘Smoking is Prohibited’ sign was also unveiled on each site. 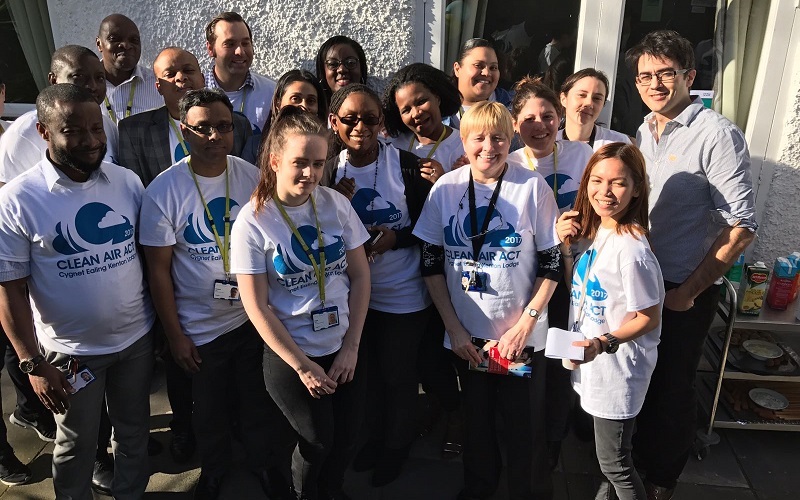 The Smoking Cessation leads and champions from Cygnet Hospital Ealing held a quiz inviting those in attendance to name the damage from smoking to various parts of the body. Carbon monoxide testing was conducted for those who wanted to find out their smoking related CO levels. A time capsule was buried on each of the two hospital sites in a special container. Everyone present provided an item to fill each capsule with. Contents include tea bag and mug (for the opener to enjoy a cuppa while going through the contents), a smoking quiz, a Metro paper, signed t-shirts, photographs, posters from the Stoptober competition, bracelets, poems, empty cigarette boxes and a few coins from our times – to see if they are still in circulation! The capsules will be opened in 10 years’ time. Instructions are enclosed for Time Capsule finders to contact ward managers to converse about pre & post ‘Clean Air Act’ days. Symbolically, a plant was planted in a former smoking area to highlight the transition and transformation of lives through this initiative.